If we are chained to something, we are not free. Where do those chains come from? And where can we find the key to open them? If you have chained yourself down with a lot of musts and shoulds, believing you must be like everyone else and do what everyone else is doing, you are truly working on a chain gang. So often time it happens, we all live our life in chains, and we never even know we have the key. 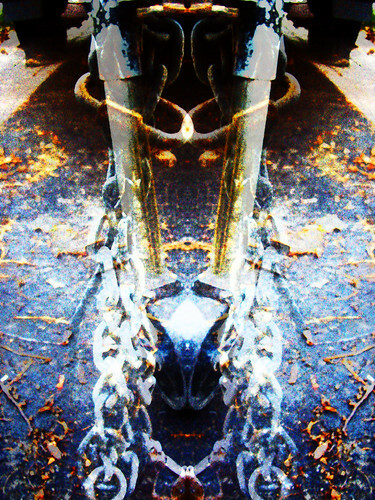 This entry was posted in Digital Art, Quotations and tagged chain gang, chains, Charles Dickens, CWWOL 2012-02-15, freedom, Mark Twain, Sam Cooke, The Eagles. Bookmark the permalink. Aloha Carol, Before reading the accompanying text I scrolled down to the image. Wow! I recognized the archetypal energy of the “Devil” from the Tarot immediately. Don’t know if that was intentional or not. However, your text mirrors a similar meaning in the Tarot, where the Devil card symbolizes the limitations we impose on ourselves based upon appearances in the material world. The key to freeing ourselves from the chains of our illusions lies in our ability to laugh at ourselves. PS – I loved the all the images from the 12th through the 14th. Have had house guests and no time to comment. You are obviously on a roll. Sandra, you have an amazing mind. Your comments are always insightful, and make me think. I love that. Thank you. Makes me think of the tasks of getting to maturity. Breaking the chains and escaping the chain gang. I love the piece! I always appreciate your perceptiveness, Paulann!